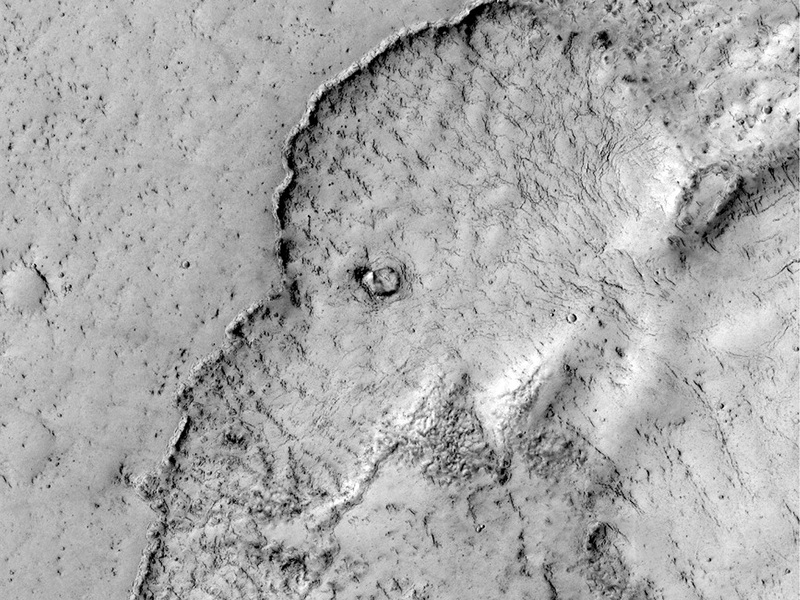 This “elephant” is actually a dried flood of lava over the surface of Elysium Planitia, a huge plain near the equator of Mars, which is the youngest flood-lava province and the second largest volcanic region on Mars, after Tharsis. It’s a classic case of pareidolia, a psychological phenomenon where human brains see familiar objects (such as animals) in random shapes. This elephant-shaped lava flood may have occurred within the past 100 million years – a relatively short time in the history of the Red Planet. Mars is largely believed to be relatively inactive at present day. Flood lavas cover extensive areas, and were once thought to be deposited extremely rapidly, like a flood of water. Now it seems that most lava floods on Mars are emplaced over years to decades, however, there is also evidence for much more rapidly flowing lava, a true flood of lava. Elysium Planitia has large volcanoes and several areas with long trenches, called fossa or fossae (plural), including the Cerberus Fossae. It has ash-covered water ice on the surface with a volume that is similar in size and depth to the North Sea. This ice, that is broken into ‘plates’, is thought to be the remains of water floods and lava flows in the Cerberus Fossae fissures about 2 to 10 million years ago. This image is taken by the HiRISE camera on NASA’s Mars Reconnaissance Orbiter. North is approximately down.